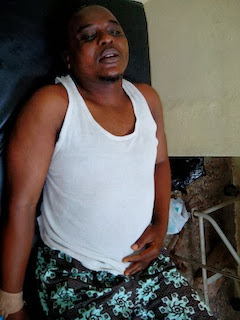 Rasheed Ibrahim, a teacher of Nigerian Navy Secondary School,Onikoko, Adigbe area of Abeokuta, the Ogun State capital was beaten to stupor by six naval rating yesterday. entrance. I called one of the officers, Aliyu to ask for what was going on and he just flared up with me and I was surprised what might have caused that. “Suddenly, another rating officer, Oyerinde who was in the security post threw a stone on my car, and when I demanded for such action from me, both of them engaged me. They were later joined by one of the Senior Officer,Mr Shodiya,who ordered that the men should beat me and they were joined by other Officers and they all pounced on me . “They used their iron belts to beat me, dragged me on the floor, used sticks and every other things available to beat me .People that were there tried to stop them, they refused to stop until the Commandant came out, by then, I had gone into coma. If not for the quick intervention of the Commandant, Rasheed would have been killed by the six naval rating.